Bless me, for I am a felon — may I be ordained? Q. I am currently incarcerated in federal prison. My question may seem strange, but I am wondering whether it would ever be possible for an ex-convict, a felon, to be accepted into holy orders. When I was a child, I was never baptized or brought up in any particular religion, but I had a strong sense of the closeness of God. Later, as I got older, I fell away from the Lord and began to lead a sinful life, which resulted in my imprisonment. While in prison, I began going to Catholic Mass and shortly I will be baptized by our Catholic prison chaplain. I read the Catholic paper regularly and find it helpful and uplifting. Here in prison, it’s easy to lose hope, to feel lonely and forgotten, but with the Lord I get stronger every day. I reflect on God’s word, feel his strength and know that he is with me. A. First, let me say how grateful I am to you for telling the story of this remarkable reawakening to God’s presence in your life. I find your words inspiring. I’m sure others will say the same. As for your becoming a priest or a deacon, it would not be unprecedented for someone to move from prison cell to pulpit. I have read, for example, of Father Donald Calloway. As a young man, he led a life of delinquency and drug use and was jailed multiple times. 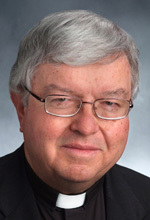 Now he is a priest of the Congregation of Marians of the Immaculate Conception, a much-sought speaker who tells of his conversion through the mercy of God. Realistically, though, I think it depends a lot on the nature of the crime for which you are serving time. In the interest of transparency, that background would have to be shared with the people whom you were to serve. If your crime were one of violence, people might feel uncomfortable accepting you as a minister of the Gospel, and your work would be compromised. If, on the other hand, it were something such as drug use from which you had clearly repented and recovered, the way might be open. What I think you should do is talk with your prison chaplain, whom you already know and trust. Get his take on the matter and, perhaps, ask him to put you in touch with the vocation director of a diocese or religious order. Even if a future in religious ministry is not in the cards, know that there are many ways to serve the Lord. Far more people do this as members of the laity, ministering to those they live and work with by showing their kindness and sharing their faith. Meanwhile, please be assured that you have my prayers, and I ask for yours. A. I have no doubt that, as a child, you were taught not to chew the host — because I was taught that, too. This was seen as a sign of greater reverence for the real presence of Jesus in the Eucharist. But there is not — and never was — a rule that says this. So it depends to some extent on the circumstances. When I am celebrating Mass, I consume a large host and find it necessary to chew it. When I am on vacation, though, and attending Mass, I revert to the habit of my boyhood and let the host start to dissolve in my mouth before swallowing it.